I just took a 1000 mile roadtrip from Oregon to Southern California. In a week I’m going back home. I definitely learned a few things along the way. 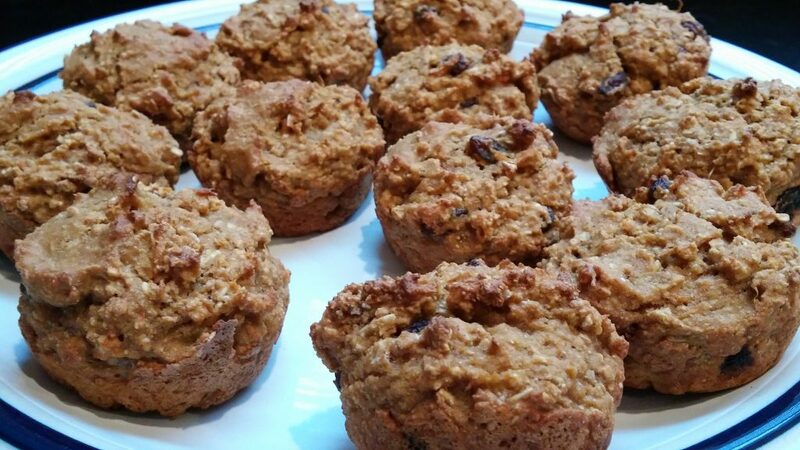 I thought it would be helpful to tell you all about my trip and include a delicious recipe for vegan sweet potato muffins, a perfect snack for your next road trip I’m still perfecting the gluten-free version. When it’s ready I’ll be sure to add a link to it here. Portland traffic is terrible so I wanted to leave by 7am. I got on the freeway at 7:15am. That’s pretty good for me. In my cooler I packed burritos, veggie burgers, tofu ranch dip, a sunbutter & jam sandwich, carrots and sweet potato muffins. I also took some apples, pretzels (have I mentioned I’m addicted? ), corn chips, fruit bars and some chocolate. I was worried I might get stuck on a pass in the snow so I packed a lot. And I bought a 6-pack of water bottles for the car. Leaving early turned out to be a great idea as I made it out of Portland very quickly. My first stop was to get some ice to pour over the food in my cooler. Since the burritos, burgers and muffins were frozen it was keeping things pretty cold. I filled up the tank, got some tea and started the very long drive for the day. My plan was to get through all the mountain passes during daylight. Then I could take a break and head to a friend for the night. I’ve got an SUV so I put the cooler in the back and kept a few snacks up front with me. Most of my stops were to get more caffeine. Starbucks are everywhere. I would go to a rest stop and look up the closest Starbucks and head over there. They don’t mind if you bring in food. The sweet potato muffins were one of my best choices. They were a filling snack and went well with my tea. I will definitely take them on my next road trip. The veggie burgers were a terrible idea. Somehow I thought it would be easy to find a place to heat them up. That never happened. On my way home I’m planning things you don’t need to heat. That first day was very long. I made it through the last mountain pass just before sunset. There was about 2 feet (60cm) of snow on the side of the road and it was just starting a light snow/rain mix. I felt pretty lucky. So let’s get to that recipe. I found it on a website several years ago and it’s one of my favorites. You can find the original recipe at https://www.savvyvegetarian.com/vegetarian-recipes/sweet-potato-spice-muffins.php. I like to make it oil-free with raisins. I’m thinking about trying it with chocolate chips. It’s an easy recipe with common ingredients. I’ve used different kinds of flour and they all work well. You could try it with a gluten-free flour mix and it would probably be fine. Set aside a non-stick muffin pan or muffin liners. Mix together the vinegar and soy milk and set aside. Mix together the flour, oat flour, sugar, baking powder, baking soda, cinnamon and ginger in a large bowl. Whisk in the applesauce and sweet potato into the vinegar/milk mixture. Slowly mix the wet mixture into the dry mixture in the large bowl. Stir in raisins. Spoon the mixture into the muffin pan so they are evenly filled. Bake 20 to 25 minutes. You can check if they’re done by sticking a toothpick in one and see if it comes out clean. 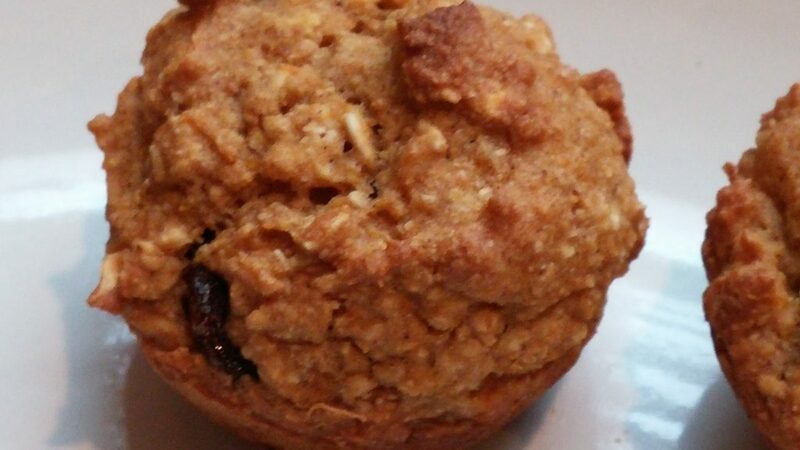 Use a knife to loosen the muffins and remove to a plate to cool. Enjoy! They are good with a little apple butter or jam too.